What is a bread knife? And why is it important to use the best bread knife when cutting bread? Well, not using the right type of knife in cutting food can be problematic. Not only will you exert more effort in the task, using the wrong tool can also damage your food. There are different types of knives as there’s a specific tool for each task in the kitchen. 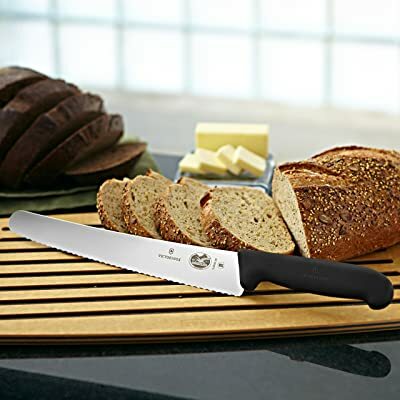 This post will particularly cover the bread knife, which is the cutting device you use (or should use) for slicing bread. Bread knives have serrated edges (just like a saw). This design enables you to the make clean cuts on whole loaves of bread, cakes, and other types of food. Yes, while bread knives are supposed to be for bread use only, they can actually replace your other knives in doing some of the cutting chores in the kitchen. 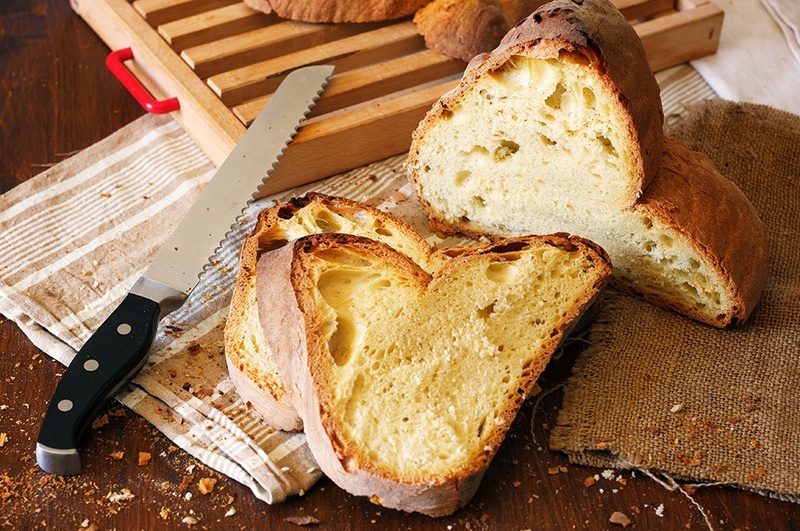 Which is the Best Bread Knife for You? Before going any further, know that there are 2 major types of knives to choose from – electric knife and manual knife. Electric knives are powered by electricity. These are more powerful than manual knives because their motor will power up the cutting process. Needless to say, they are more expensive than manual models. For a manual knife, you (the user) will have to perform a sawing motion to slice through food (video). Just do this repeatedly until all the work is done. If you’re using an electric knife, all you need to do is to guide the knife on the food that you’re cutting. You really don’t have to make a lot of sawing motion with an electric knife – you simply need to position it on the portions that you’re slicing. Now that you’re decided on buying a bread knife, make sure that you consider the points listed below. Length – The standard size for bread knives is anywhere from 7 to 10 inches. This length only refers to the size of the blade, not including the handle. With the handle, the total length should be around 12 to 15 inches. While longer knives are more versatile as they can slice bigger types of food, they’re also harder to control. Design – There are 2 designs of knives – straight and curved. In straight bladed knives, the handles are in line with the blade. In knives with curved blades, the blades are positioned lower than the handle. There’s more clearance for fingers and knuckles with curved bladed knives. The shape of Serrated Knife – A serrated bread knife comes with teeth-like edges. Typical serrated knives have pointed teeth, but these are not the best tools for cutting bread. Models with wavy grooves perform better when it comes to slicing bread. The spacing of Serrations – Widely spaced serrations provides cleaner cuts. This is applicable to both pointed serrations and wavy grooves. Maintenance – K﻿﻿nife﻿﻿ maintenance include cleaning the unit and keeping it sharp. Look at the instructions on a model of a knife to see whether it requires hand washing or if it’s safe to wash in the dishwasher. 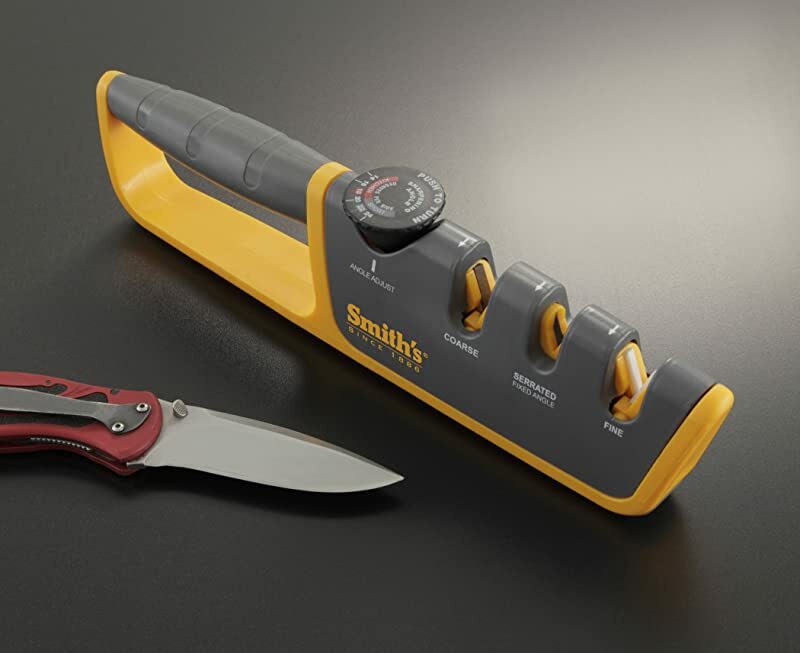 When it comes to sharpening dull knives, you have the option of using a knife sharpener, having your knife professionally sharpened, or buying a new one. Do consider all of the above points, especially the design and shape of the bread knife to end up with a well-balanced and easy to use the knife. Power – This Cuisinart electric knife is powered by 130 watts motor. Handle Design – The housing or handle is ergonomically designed for ease of use. It also holds the blade and the electric cord. Package – Included in the package are the following: wood block tray, bread blade, and carving blade. The bread and carving blades are removable and interchangeable. Cleaning Procedure – The blades are dishwasher safe and can also be hand washed with hot soapy (mild soap) water. The blades are made of durable stainless steel. It’s easy to operate as only minimal pressure is required to turn the unit on. The blades are easy to change (there’s a release button). It’s versatile and can make thick and thin slices of bread. It’s quite heavy because of the handle housing. Note that this electric knife is not just for slicing bread. It also comes with a carving blade that can be used to cut meat. As the most advanced (and only electric model) in this Top 6 list, I consider it to be the best bread knife on the market today. The Pure Komachi Japanese bread knife is a manual type of knife. Its blade has a wavy design and it’s available in the color orange. Length – The blade measures 8 inches long and the handle measures about 4 ½ inches. The total length of the knife is 12.5 inches. Materials – It comes with high carbon steel blade. Color Design – The orange color is FDA-approved. The resin coating on the blade is safe to come into contact with food. Handle Design – Its handle is ergonomically designed and lightweight. Cleaning Procedure – Hand wash the knife using mild soap and water. Pure Komachi’s color coding design serves as a guide as to which type of knife to use for a specific task. It comes with a blade cover for safety. The knife is sharp, so it cuts really well. The resin coating can flake off if the knife is not taken care of. Remember to hand wash the knife instead of washing it in the dishwasher. This manual bread knife from Mercer comes with a wavy blade design. It’s available in the following colors: black, white, brown, blue, red, green, purple, and yellow. Length – The blade’s length is 10 inches. Handle Design – This knife’s handle is built with comfortable and durable handle. Cleaning Procedure – Hand wash with mild detergent and water. You can feel that the entire knife is well-balanced. This long blade model of knife is a good bread knife and it’s reliable for cutting bread. 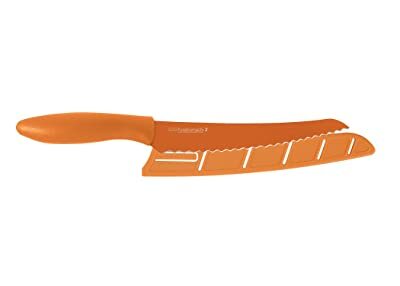 You can also use it for cutting other types of food. I like that it’s available in different colors. Length – This knife blade is 10 inches long and the handle is 5 inches long. The knife’s total length is 15 inches. Handle Design – The ergonomically designed handle is made of solid walnut wood, and its secured by 3 rivets. Blade Design – This is a full tang knife – the blade extends from the tip of the knife to the end of the handle. Cleaning Procedure – Hand wash it with mild soap and warm water. The wood handle is very beautiful. The knife’s length and size makes it a versatile cutting tool. It’s easy to hold and control. It can sometimes fail in slicing soft bread. This is a beautiful multipurpose knife. Chicago Cutlery fans will surely love it, and first-time users will appreciate it, too. This Victorinox bread knife is a manual model with wavy blade design. You can get it in black color. Length – This is a 10-inch knife with a 5-inch handle. The total length of the knife is 15 inches. Design – It comes with a curved design, so you can use it in a rocking motion when cutting food (not just bread). 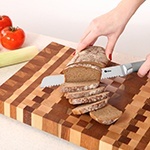 This design also provides for a good knuckle clearance when slicing or cutting stuff. Handle Design – The handle is ergonomically designed to be easy on the hands while using. Cleaning Procedure – Although this model of knife is dishwasher safe, it’s still better to wash it by hand. The knife blade is sharp and can, therefore, make clean slices. There are no rivets or screws that can loosen up. You can sense that it’s well-balanced. 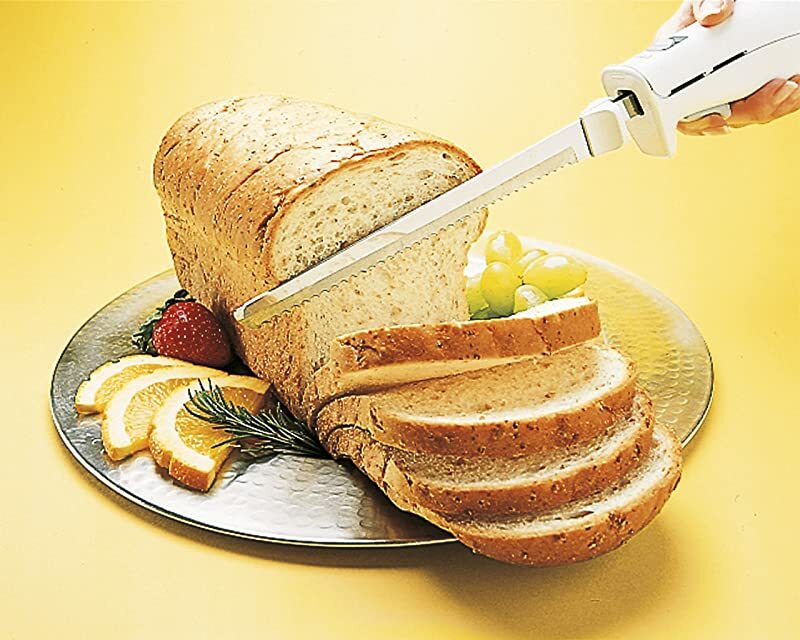 This is an all-around bread slicer that can also be used as a cutting tool for other types of food. 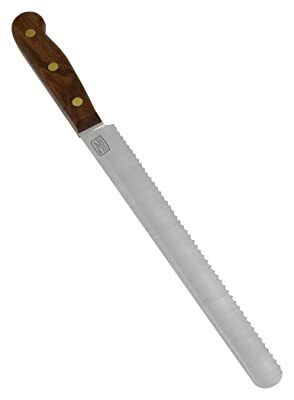 Because of its length, you can use it in cutting large items of food. The Orblue manual bread knife is designed with a straight blade and wavy serrations. It’s available in the color of silver. Materials – It’s made of the stainless steel blade. Handle Design – This knife is made of 1 piece of metal. Cleaning Procedure – It’s dishwasher safe, but you can also hand wash the knife with warm water and mild detergent. It’s the ideal size for slicing small loaves of bread. The long handle makes it easy to use. The blade is sharp and can make a clean cut. There’s a hollow feel to the knife. This multi-tasking knife can be used on bread and cakes as well as fruits and vegetables. It’s a small bread knife that can be used to cut any type of food. 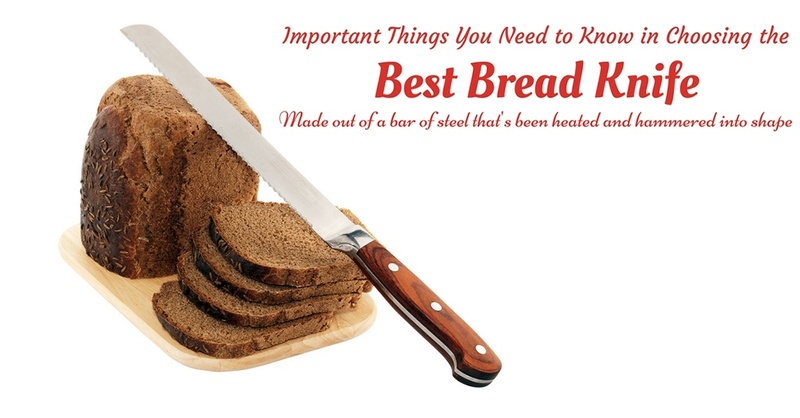 Now that you have a list of some of the best bread knives on the market, you will have a guide when choosing the best model for you. Let me just say that I highly recommend the Cuisinart bread knife if you’re looking for an electric model. While it’s more expensive than manual units, it’s easier to use and you can also use it on meats. The manual knives on the list are all good, too – but I’m recommending the Pure Komachi Japanese knife because of its versatility and design. The knives from this Company come in different colors (depending on the task) and this color coding technique also works well in avoiding cross-contamination among different types of food. 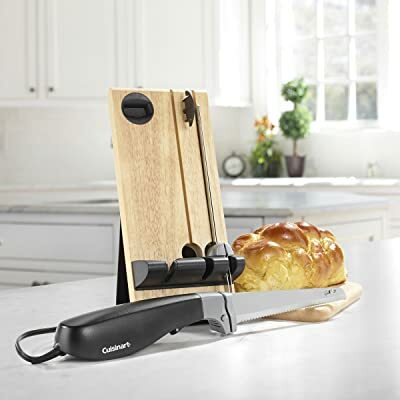 In both the Cuisinart and Pure Komachi knives, you will notice that I recommended same-length knives – they’re both 8 inches long (blade length). The Cuisinart has a total length of about 12 inches (since it comes with a 4-inch handle) and the Pure Komachi Japanese knife has a total length of 12.5 inches (it has a 4.5-inch handle). With their total length, you can also consider these products if you’re particularly looking for a 12-inch bread knife. In my opinion, the size of the knife is very important because your movement will depend on this factor greatly. The total lengths of both knives are ideal for full control and safety – no matter what type of food you’re cutting. Safety is very important when using a knife to cut bread, always remember that. So anyway, I hope I’ve helped you choose the best bread knife for you with this review post. Feel free to share it with others and don’t forget to leave your feedback below. 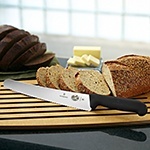 For more knives like santoku knives, bread knives, butcher knives, electric knives and grater, see ﻿them here﻿﻿.